I can't believe I fell for it. There are no windows. No doors. The lift is the only way in or out. What's he going to do to me? If I'm right, the lift will come down in five minutes. It did. Only this time it wasn't empty . . .
Quite honestly I don't have huge amounts to say about this book. I read it and it only took a few hours. It was OK but not mind blowing like I thought it would be. I often like books written in diary format but in this case I didn't really feel like there was much to tell. I didn't feel like I got to know the characters all that well and ultimately I didn't feel like there was a point to the entire book because of how it ended. 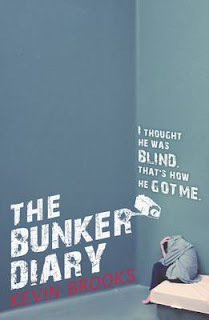 It definitely did capture the feel of the bunker and the isolation it felt but I didn't feel there was enough in the story to make it one I could really get into. Not one for me I'm afraid. It's such a shame this didn't blow you away. The ending was my favourite bit of the book.